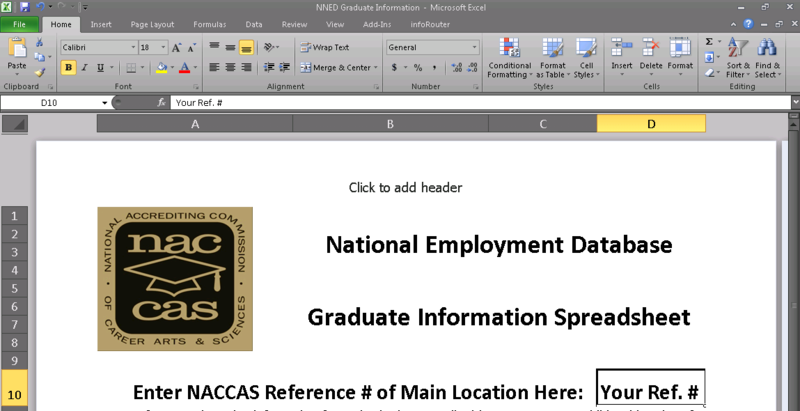 The “NNED Graduate Information” workbook and “NNED Survey Card Mail Merge” document have been created to simplify the production of Survey Cards for the NACCAS National Employment Database. Follow the below instructions to create a table including the basic required information for each of your graduates and then print Survey Cards for each via Mail Merge. You will require the following information for each graduate: first & last name; the last four characters of either their Student Identification Number or Social Security Number; email address; and year of graduation. Should you prefer to create survey cards manually, an editable PDF template is available here. Additionally, you will need to procure printing paper in advance of creating the mail merge. The templates have been designed to create 2 X 3.5 inch survey cards. You may use appropriately-sized business card printing paper or card stock paper which you will then need to cut manually. 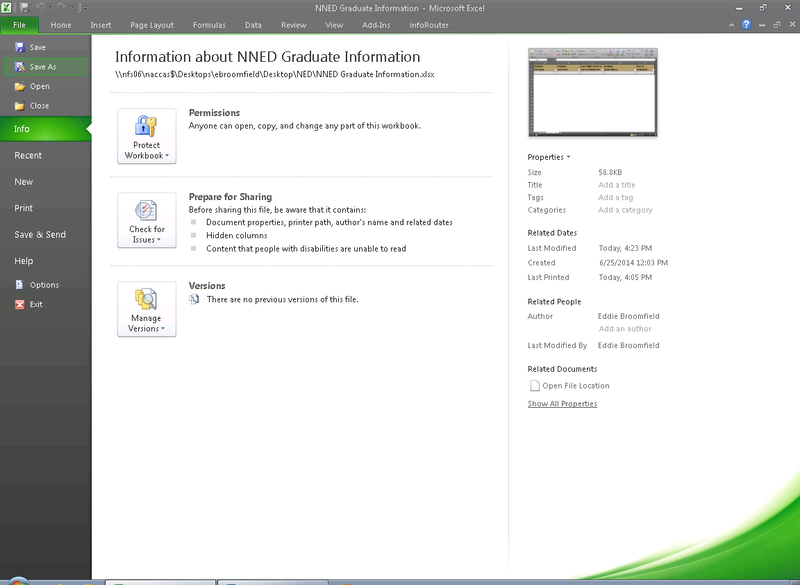 Note: The “NNED Graduate Information” and “NNED Survey Card Mail Merge” templates were created using 2010 editions of Microsoft Excel and Microsoft Office, respectively. These instructions have been created from the same software. The steps necessary to complete this process within other office productivity software or other versions of Microsoft Office products may vary. Please consult your IT specialist if necessary. 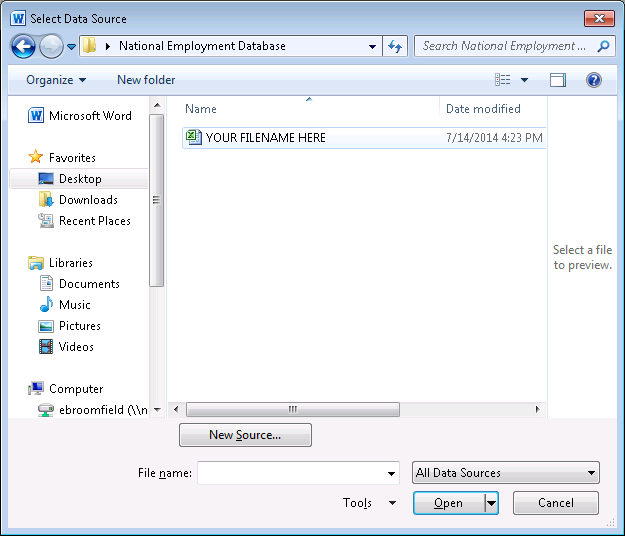 1) Open the “NNED Graduate Information” Excel file. 2) On the “Instructions” worksheet, read all instructions and enter the NACCAS reference number of the main location in Cell D10. 3) On the “Graduate Table” worksheet, enter all requested information for the graduates for which survey cards are to be printed. The Excel file has been designed to automatically assign Graduate ID numbers to each entrant based on the information provided. 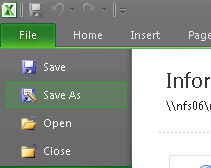 5) A “Save As” window will open. 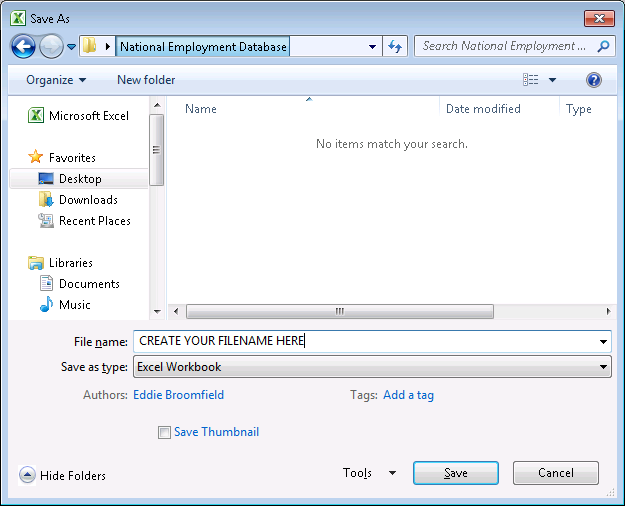 Type in a new filename into the “File name” field and click “Save.” Note the destination to which you are saving the file. You might consider saving to your desktop or another easily-accessible location. 6) Load the desired paper into your printer. 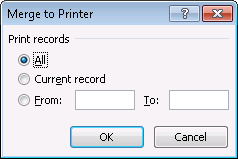 Note that you may have to adjust the settings on your printer to utilize your chosen paper type. 7) Open the “NNED Survey Card Mail Merge” Word document. 8) The following Dialogue Box may appear. If so, select "Yes." 9) Click on the “Mailings” Tab. 10) Click on the “Select Recipients” button and then select “Use existing list . . .” from the drop down menu. 11) A window will open titled “Select Data Source.” Navigate to the location to which you saved the excel file in step five (5) above and double-click the newly created Excel file. 13) Click on the “Finish & Merge” button and then select “Print Documents . . .” from the drop down menu. 15) A new window will open entitled “Print.” Click “OK.” Word will merge the entries from your Excel file into the “NNED Survey Card Mail Merge” template and print one survey card for each entry on your Graduate Table.